Wacker Thun still waiting for the rival at Swiss Play-Off Final! Pfadi Winterthur overtook control over semi-final series by beating Kadetten in Schaffhausen 28:27 (16:13) in game number 4 for 2:2. The last decisive match will be played in Winterthur. Kadetten Schaffhausen: Stevanovic/Kindle (25. bis 38. 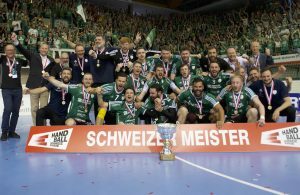 ); Meister, Liniger (2), Csaszar (8/4), Pendic, Brännberger (3), Beljanski, Gerbl (3), Norouzi (9), Szyba, Luka Maros (2), Tominec.